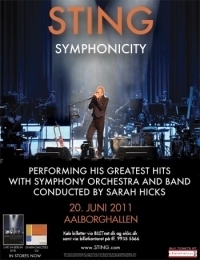 Nordjyske’s critic Bent Stenbakken ended up completely surrendering to the Sting concert on Monday evening in Aalborg. He gave it six out of six stars. Can you expand relatively simple pop songs and get them to give new musical meaning by playing them in grandiose symphonic arrangements? This question is usually relatively simple to answer. The answer is, namely, no. The melodic material is normally too thin, resulting in nice-sounding but actually irrelevant layers of musical background that merely get in the way, without adding anything rewarding or new. But then, of course, there’s Sting. 59 years old. Already in the days of the trio The Police, he drew attention to himself with his captivating pop numbers. Punk energy was combined with elements of reggae and melodic pop, tightly played with dancing distinct drums, cool bass, energetic rock guitar and some howl-along-choruses that could quickly fire up an audience. Pop according to the saying “less is more”. And it worked. So this Monday evening the question was - could Sting and his band get the selected group of musicians from Aalborg Symphony Orchestra to function as one big rhythmic unit? Again the answer is quite simple. Yes. At cat-like ease with himself, dressed in black with a short trendy cadet jacket and tight pants, his hand resting lazily on the microphone stand, Sting steered his musicians with friendly authority through a sparkling array of newer and older material. “If I Ever Lose My Faith In You” was the opening number, and that is indeed how it went. We never lost our faith in this ambitious project. Sting had prepared both his band and the local orchestra musicians in such a way that the interaction between the popular and the sheet-music-oriented musicians, as far as the beat’s precision and drive, functioned optimally. The audience started getting fired up already during the first number, clapping rhythmically with the beat. And it didn’t get any less loud when “Englishman In New York” started with a dark, floating clarinet solo before Sting and the symphony-band took over. And there was even room to jazz it up a bit in the middle. Well-deserved kisses on both cheeks to the clarinet soloist, Randi Østergaard, from Sting. There were surely a few orchestra musicians who would have gladly changed places with her at that moment. “Roxanne”, of course, had red stage lighting in the background. The song about the prostitute who sells her love featured Sting playing his small acoustic guitar and a wonderfully bowed passage by the solo cellist, Ian Phillis. 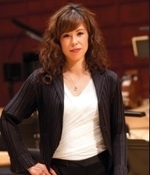 Then came a bit more rock-oriented pop in “Mad About You”, but the symphony orchestra’s sound remained elegantly utilized throughout. And space was made for instrumental solos. Good ones. But never drowning out the inner core of the songs. Dynamic changes went from hushed to full symphonic blast. “Russians”, a song about the idea that if the Russians love their children as we do, they wouldn’t want to drop an atomic bomb either, was highly relevant when it was written in 1984. Here it was presented in a fresh version with the symphony orchestra's angry, aggressive Cossack-like, Prokofiev-borrowed arrangement, and when Sting's voice rises clear, light and high, floating above it all - yes, it doesn't get much better than that. Sting himself at times played the acoustic guitar, the wailing harmonica, and he also liked to tap rhythmically the tambourine attached to his microphone stand. Sting's own band was always professional and inspired, all as it should be. Here, nothing was left to chance. The percussionist Rhani Krija had the difficult task of creating an extremely precise underlying rhythmic drive, which he managed optimally. Guitarist Dominic Miller had occasional, but for my taste too few, electric solos. Bassist Ira Coleman was rock solid on both string bass and electric bass, and we heard beautiful, heartfelt singing by vocalist Jo Lawry, including a heartrending soul-inspired duet with Sting in "Whenever I say Your Name". The calm, serene and heartfelt "Fields Of Gold", with beautiful waves like a golden cornfield, was the first set's penultimate number, before we were sent off to the intermission with an unrestrained, punk-energized "Next To You". The second set continued in the same way with the self-assured, supple band, and there was room for several of Sting's more mature works from his solo career. "Shape Of My Heart", then the vampire hymn "Moon Over Bourbon Street", during which Sting, dressed in a long frock coat, with a choking grip made out to attack an unsuspecting stage hand who, fumbling, crouched on the stage with a monitor. After that the audience clapped along with the beat again in "King Of Pain" before the first show-stopper "Every Breath You Take" got the whole audience clapping and on their feet. Encores were unavoidable, and a clearly content and excited Sting heated things up - even belly-dancing - with the Arabian-flavored "Desert Rose". Even more applause brought forth "She's Too Good For Me" and then the delicate "Fragile". The concert finally wrapped up with Sting playing solo guitar while the entire audience sang along to "I'll Send An S.O.S. To The World, I Hope That Someone Gets My Message In A Bottle". - "That's bloody all right" I heard someone say in a North Jutland dialect behind me while we were still clapping our farewell to Sting in symphonic style, after two and a half hours of music. Not just all right, the delivery was a success. Sting's songs floated beautifully, in at times subdued but always full-bodied arrangements, where the innermost rock nerve was never cut. Many thanks to Sheila and Inkeri for taking the time to translate this review for the site!